Aboriginal and Torres Strait Islander students accounted for 6.9 per cent of students at government schools and 2.4 per cent of students in non-government schools. Recurrent expenditure by Australian, State and Territory governments on school education in 2014‑15 was $53.0 billion, of which $40.3 billion was spent on government schools. Improving educational outcomes for all young Australians is central to the nation’s social and economic prosperity and will position young people to live fulfilling, productive and responsible lives. The goals for school education are that: 1) Australian schooling promotes equity and excellence; and 2) all young Australians become successful learners, confident and creative individuals, and active and informed citizens. that enables young people to make a successful transition from school to work and/or further study. has a focus on quality teaching and world-class curriculum and assessment. 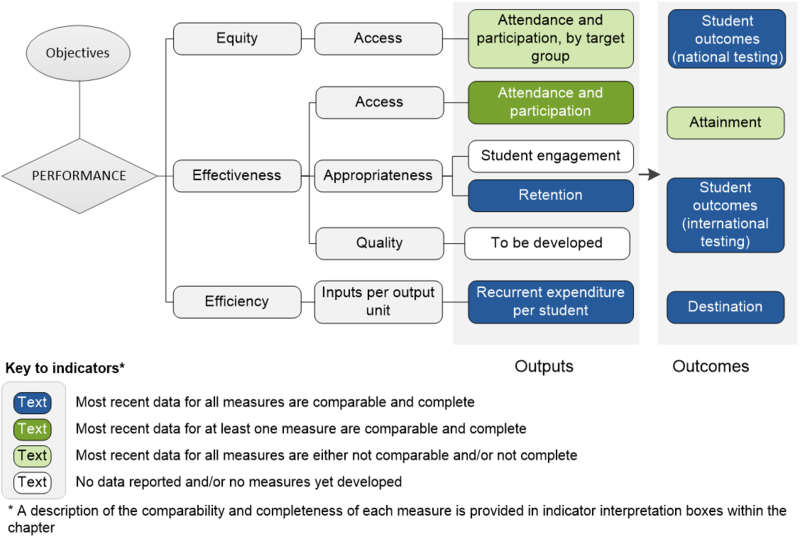 The performance indicator framework provides information on equity, efficiency and effectiveness, and distinguishes the outputs and outcomes of school education. The performance indicator framework shows which data are complete and comparable in the 2017 Report. An overview of the School education performance indicator results are presented. Information to assist the interpretation of these data can be found in the indicator interpretation boxes in the School education chapter and attachment tables. AQF = Australian Qualifications Framework. FTE = Full time equivalent. NAPLAN = National Assessment Program - Literacy and Numeracy. These data and caveats for these data are available in chapter 4 and attachment 4A.